As an Atlanta transplant, I can’t help but feel more and more excited as we inch closer to #SB51 to watch the Falcons bring home a win. Rather than spend these last few days of work analyzing my football square picks or planning my party menu (okay, I will share just one recipe I’m making – and yes, it has bacon), I am trying to channel my enthusiasm into something well, productive. 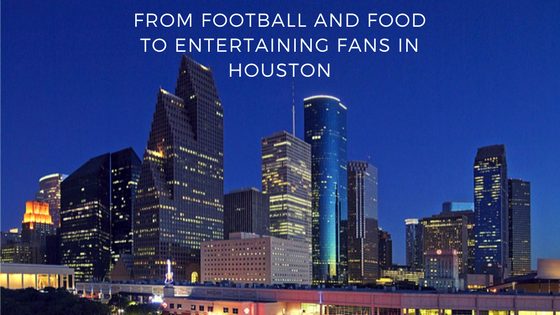 Aside from football fans seeking good food and Texas-sized fun, many #eventprofs and #tradeshowprofs are in Houston to entertain the masses with events and experiences like the NFL Experience Driven by Genesis at the George R. Brown Convention Center. With this in mind, below are some practical tips and some decadent recommendations for filling your bellies and your time. Bovine & Barley – they have several TVs and a mouth-watering appetizer selection (hello Texas Tots). There is even a private room for viewing #SB51 with 29 of your closest friends or clients. Eight Row Flint – think of this as an all-day event with a huge patio and specials like happy hour tacos! Lucky’s Pub – lots of specials and walking distance from the convention center. Luke’s Icehouse – snag a spot in front of a TV and munch on burgers and Tex-Mex appetizers. The Original Ninfa's – in business since 1973, and home to Mama Ninfa’s legendary Tacos al Carbon, you can’t go wrong. Truluck’s – if you are seeking an upscale dining experience and fresh seafood, you are in luck. Beaver’s – an inventive menu and grown-up games to help you unwind after a long event. Edison - the chef was born in New Orleans and raised in Texas so you can expect amazing flavors from a seemingly simple menu. Hops Meet Barley - 150 beers, gorgeous, dog-friendly deck and appetizers for sharing – now that is how I envision a perfect Sunday afternoon. The Shops at Houston Center has a variety of good restaurants and shopping within walking distance. Check out Houston Bcycle and pedal your way back to good health. You can rent a bike for $5 from any Bcycle location (there are several throughout the Downtown area) – rent it, go exploring and return it to a Bcycle location when you’re done. The Buffalo Bayou Park trails are just a couple blocks away from Downtown and perfect for bike-riding!